The latest from Helen is a must have tutorial! A steal at $20.00! 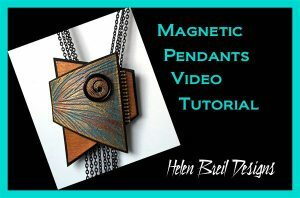 Helen has just released a 90 minute video class introducing an exciting new form of jewelry – magnetic pendants! 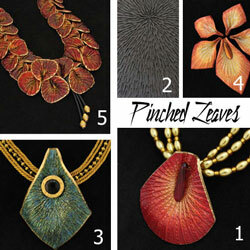 Click here to access the Magnetic Pendants class. 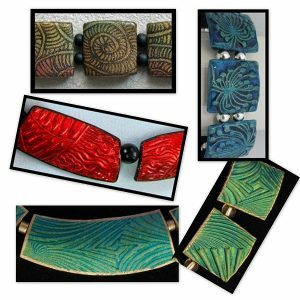 Shades of Clay carries a large selection of ART-C Wax, Gilders Paste, Viva Decor Inka Gold as well as other tools and supplies featured in Helen’s videos. Coming soon…magnets! 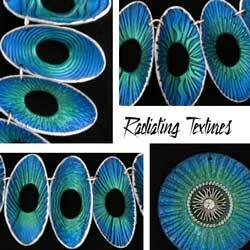 And visit Helen’s website for tutorial related gallery photos, project ideas and inspiration. All other tutorials (below the videos) are pdf format and will be available for download after you purchase them from our store. A link for your download will arrive via email within 24 hours after purchase. 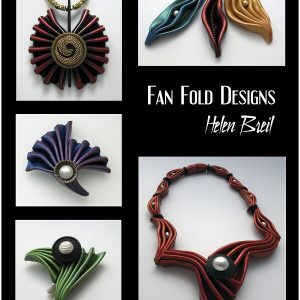 Another beautiful ebook by Helen BreilFan Fold Designs PDF mini eBook (52 pages, 150 photos) $15 CADPlease note: all of our Helen Breil virtual products will arrive via an email from Mike Breil. We strive to do this in a timely manner. Learn Helen's fun Free Form Fandangle technique (originally introduced in the Orange issue of From Polymer to Art magazine). 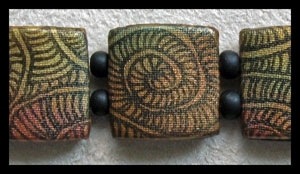 In this project she replaces the traditional use of wire with a polymer clay snake that acts as a bezel or frame. 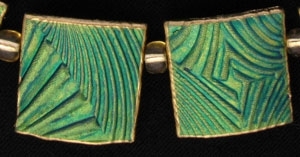 The bezel is filled with dynamic and fun textures and wonderful metallic colors are added. It's an easy and fun project with lots of possibilities! Classed as beginner/intermediate, this tutorial covers 10 pages of instructions, 25 step-by-step photos plus an inspiring Design Idea gallery.